Efficient and reliable detection and characterization of microheterogeneities in therapeutic mAbs and ADCs is of critical importance, as sources of variability inherent to the development and manufacturing process have the potential to affect the quality of the final product.1 For Pfizer, improving efficiency and reliability in the process of characterizing protein therapeutics is of critical importance. To help the company achieve its required benchmarks, scientists from Waters took on the challenge of engineering a novel reversed-phase liquid chromatography (RPLC) column for high-throughput separations with enhanced resolution, selectivity, and recovery of target mAbs and ADCs. Unlike small molecule drugs, therapeutic mAbs are large, complex biomolecules, typically produced in mammalian cells through recombinant DNA technology. Several factors, including differences between cell lines, or between different clones derived from the same cell line, and variability in post-translational modifications during expression can result in batch-to-batch variability in the final product (Figure 1).2 Some degree of microheterogeneity can be tolerated by patients and is inherent to the process of mAb development, similar to the natural variability occurring in all biomolecules. However, to ensure consistency in the quality of the final product, a set of predefined critical quality attributes that have the potential to influence the quality, safety, and efficacy of a given biologic have to be monitored closely and kept within a certain limit, range, or distribution. Waters responded to the need for more efficient and reliable methods for the separation and characterization of protein therapeutics by assembling a multidisciplinary team of research scientists tasked with engineering a column that would raise the standards for separation performance. Figure 1. A monoclonal antibody (mAb) and some example variants that are of consequence to structure and function. The BioResolveTM RP mAb Polyphenyl Column is purposefully designed to yield improved separations for deamidation, oxidation, and drug-conjugate variants. Engineering a column that addresses the most pressing challenges in reversed-phase separation technology required a multidisciplinary team of research scientists working their way through nearly 200 prototypes over a period of three years. A close partnership with scientists at Pfizer’s Analytical R&D Mass Spectrometry and Biophysical Characterization Group was integral to the success of the project and ensured the end result would bring maximum value to the biopharmaceutical scientists working with mAbs and ADCs. Figure 2. A schematic of the BioResolve RP mAb Polyphenyl stationary phase and examples of its benefits. Pfizer’s Analytical R&D Mass Spectrometry and Biophysical Characterization group has incorporated BioResolve RP mAb Polyphenyl Columns in its standard operating procedures for the characterization of many mAbs and bioconjugates within the company’s pipeline, and have recognized substantial, tangible successes. Overall, use of the BioResolve RP mAb Polyphenyl Columns continues to provide high recovery, high-resolution separations for right-first-time analyses without extensive method development. Pfizer scientists and teams can be more confident that the respective protein and conjugate forms are closely monitored in terms of molecular integrity and/or extent of conjugation for assessment of product quality, safety, and efficacy. Figure 3. 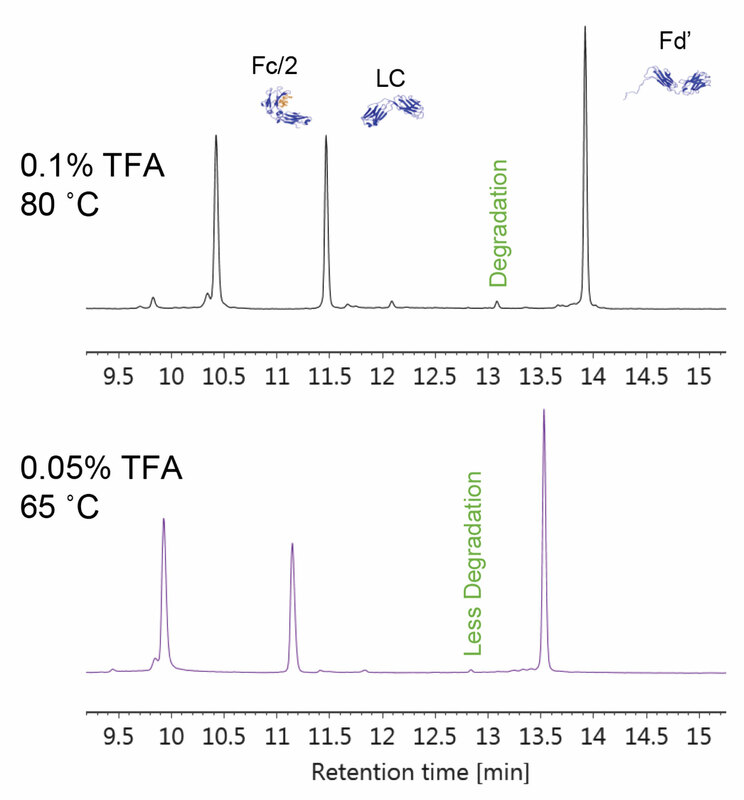 RPLC chromatograms obtained during the analysis of a mAb subunit sample, wherein the BioResolve RP mAb Polyphenyl Column was used along with lowered temperature and a reduced concentration of acidic ion pairing additive (TFA, trifluoroacetic acid) to minimize on-column degradation and to thereby produce a higher fidelity and more accurate profile of the sample’s composition (purple trace). Jacquelynn Smith is a scientist at the analytical R&D and biophysical characterization group at Pfizer. Matthew A. Lauber, Ph.D., is a consulting scientist at the Chemistry Technology Center at Waters. 1. Wang, X., An, Z., Luo, W., Xia, N. & Zhao, Q. Molecular and functional analysis of monoclonal antibodies in support of biologics development. Protein Cell 9, 74-85 (2018). 2. Liu H, Gaza-Bulseco, G. & Faldu, D. Heterogeneity of monoclonal antibodies. J Pharm Sci 97, 2426–2447 (2007). 3. Q8, I. Pharmaceutical Development, Step 4. International Conference on Harmonisation of Technical Requirements for Registration of Pharmaceuticals for Human Use. (Geneva, Switzerland, 2009). 4. Q9, I. Quality Risk Management, Step 4. International Conference on Harmonisation of Technical Requirements for Registration of Pharmaceuticals for Human Use. (Geneva, Switzerland, 2005). 5. Q10, I. Pharmaceutical Quality System, Step 4. International Conference on Harmonisation of Technical Requirements for Registration of Pharmaceuticals for Human Use. (Geneva, Switzerland, 2008). 6. Q11, I. Development and Manufacture of Drug Substance — Chemical Entities and Biotechnological/Biological Entities, Step 4. International Conference on Harmonisation of Technical Requirements for Registration of Pharmaceuticals for Human Use. (Geneva, Switzerland, 2012). 7. Yu, L.X., et al. Understanding pharmaceutical quality by design. AAPS J 16, 771-783 (2014). 9. Wakankar, A., Chen, Y., Gokarn, Y. & Jacobson, F.S. Analytical methods for physicochemical characterization of antibody drug conjugates. MAbs 3, 161-172 (2011). 10. 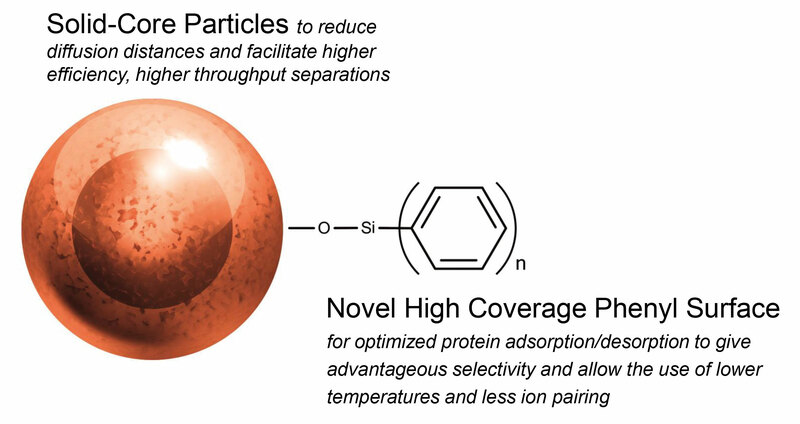 Bobaly, B., Lauber, M., Beck, A., Guillarme, D. & Fekete, S. Utility of a high coverage phenyl-bonding and wide-pore superficially porous particle for the analysis of monoclonal antibodies and related products. J Chromatogr A 1549, 63-76 (2018). 11. Nguyen J, Rzewuski S & D, W. A Novel Phenyl-Based RPLC Stationary Phase for High Throughput, High Resolution Characterization of Protein Therapeutics. in 22nd Symposium on the Interface of Regulatory and Analytical Sciences for Biotechnology Health Products (2018). 12. Smith J, Friese O.V & Rouse J.C. High Resolution Chromatography – Mass Spectrometry with a Novel Phenyl RPLC Column for Heightened Characterization of Hydrophobic Monoclonal Antibodies and Antibody Drug Conjugates. In 22nd Symposium on the Interface of Regulatory and Analytical Sciences for Biotechnology Health Products (Washington, DC, 2018).